So here we are, sitting in a conference room, with a remote designer over Discord having sound issues and what not. And we just got our themes. We have already decided not to do this “whatever you want” theme, coming up with ideas in a limited timeframe is a part of this experience, and we're on it. Two hours go by. App for streamers to create meetups, Tinder for coders, LinkedIn and StackOverflow ripoffs, websites for teaching how to code... All of this is either useless or already exists. And then an “aha!” moment: contests for open source contributors! We can do this, this will be fun for communities to play around. A real deal! We're working from Russia, which means the hackathon started in the evening for us. 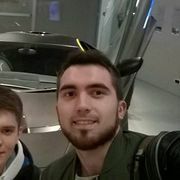 Unexpectedly, internet goes off for team in Ekaterinburg, and all of us decide to do a break. We've done project setup, design mockups are done. Good night! HTML, SCSS, Typescript, Angular. More HTML, SCSS, Typescript and Angular. We should've gone for two frontend devs instead of one. Back in Novosibirsk, Alex is installing Adobe Premiere Pro and Adobe Audition. There will be some nasty practices later, but now it's all good. He's choosing between blue and green colors for buttons. And here I am writing this story. 35 minutes left till the deadline, heart is racing: I hope to get this post right, and right in time. Let's see what we've done. The app came out pretty simple to use: the hardest part is logging in with GitHub. 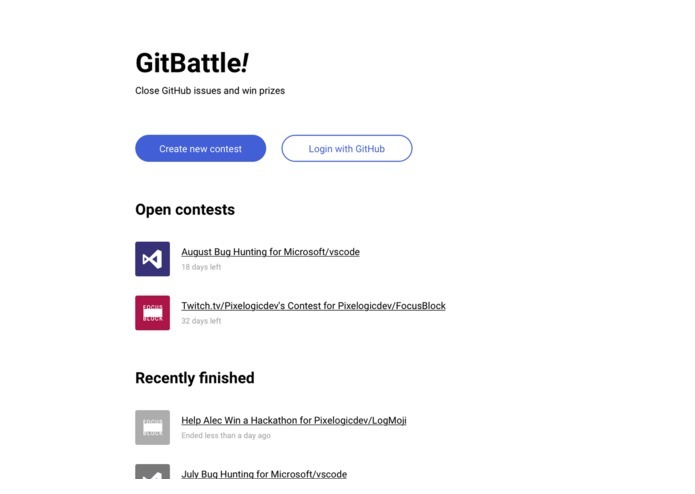 Then you're able to see what contests are live, or create your own from one of your repos over at GitHub, then selecting which issues you want people to close and how much points they will get for closing them. It's all about closing issues. But contributors should remember that repo's owner accepts only good pull requests, not the ones that came first. Behind the scenes app uses dynamically generated labels for issues to keep track of all the settings. 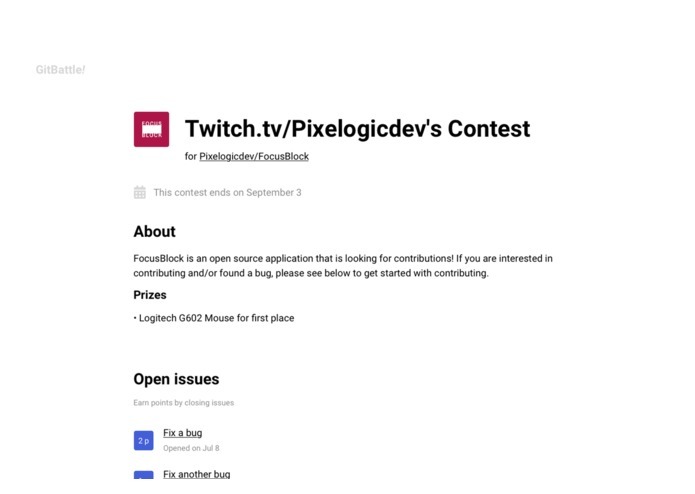 This also means you can spot what issues take part in contests by just visiting GitHub and opening Issues tab. The theme for this app is “Create a tool that can help bring a community closer together”. The app was built with limited development time in mind, which means there's still a lot of bugs and not all we've put in MVP is done. For the last few hours we've been dealing with CORS issues and unfortunately have not defeated them all. But it is open source, and if you like it, feel free to contribute on GitHub!